Soaring takes advantage of rising air currents. We call these currents “lift”, or because they are often air heated by sun-warmed ground, “thermals”. 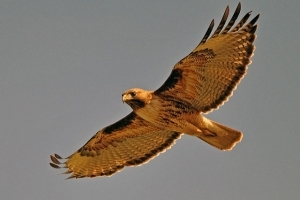 Birds, especially raptors, use thermal lift to fly long distances and loiter in the air, staying aloft seemingly without effort. Soaring pilots look for birds, as they excel at finding the best lift. Sharing a thermal with hawks or eagles is a wonderful experience! The beautiful cumulus clouds that fill the spring and summer sky are the result of water condensation atop rising thermals. These clouds are markers and the visible evidence of good soaring conditions. When conditions permit, is is possible to fly for hours and travel hundreds of miles in sailplanes. 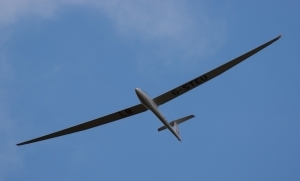 Sailplanes (also known as gliders) are designed with the lowest possible aerodynamic drag, to glide as far as possible while losing the least amount of altitude. They otherwise have all the elements of standard aircraft including flight controls and basic flight instruments. Some include engines for self-launch or power-assisted glides. In the US, launch is usually by towing aloft behind a power plane, with the glider pilot releasing the tow line when reaching the desired altitude. Modern material technology – fiberglass and carbon fiber – allows designs with long thin wings and sleek fuselages. The best current sailplanes are incredibly efficient. They can glide losing less than 100 feet for every mile covered, a 53:1 glide ratio. 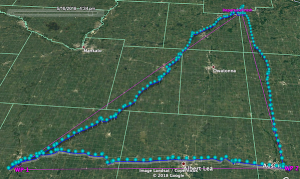 Recently, cross-country pilots have been posting their flight logs online, comparing flights with others in friendly informal competition. You can view flight traces from all over the world, with individual or club competitive standings. More locally, here: OLC in America or, for north-central United States including Minnesota, here: OLC Region 7. For the competitive pilots, there are local fun contests and more serious regional and national championship contests for different classes of sailplanes. There will be a R7 contest in Albert Lea Minnesota, May 11-18. See the calendar here for details. The International Gliding Commission (IGC) has established a series of badges, known throughout the world. Since the badges recognize increasing levels of accomplishment, they encourage the soaring pilot to further develop their soaring skills. The Soaring Society of America administers the badge program for the United States. See SSA Badges for information on these. State and National speed and distance records are found here: SSA Records. Some records stand for years – they can be very hard to beat even in the same geography and local climate.